Salvation And Survival: Got Milk? Deciding to store food items for the long-term is a real commitment. For us, space was a prime consideration, along with determining exactly what we pictured ourselves consuming if we were faced with a weather-related emergency, skyrocketing hyper-inflated food prices, or a SHTF scenario. We discovered that milk was high on that list. And since we are skim milk drinkers in our household, nonfat dry powdered milk was an obvious choice. But it quickly became apparent that the usual powdered milk brands were good for a limited time period and were subject to becoming rancid. Then we were introduced to Family Home Storage, an affiliate of LDS (Latter Day Saints). We are able to buy a 25-pound bag of Nonfat Dry Milk for $47.00 and a few pennies. That bag translates into six #10 cans of milk with a storage life of 20 years. We figured the cost at a little over 16 cents per gallon! Compare that to the price at your favorite grocery store chain! And a rough estimate of how many gallons per #10 can? 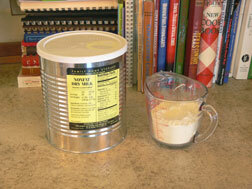 I would guess approximately 16-18 gallons of milk can be made from one #10 can. That means one 25-pound bag of nonfat dry milk could yield 6 cans, or in the neighborhood of 100 gallons of milk! And what's even better, it passed the taste test for my very picky husband. In fact, he likes the rich taste better than store-bought skim milk. And at 16 cents/gallon, there is a lot of milk-drinking going on at our house! 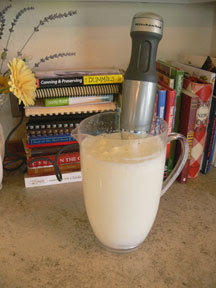 Fill up gallon container with milk and powder, then mix with hand-held blender. 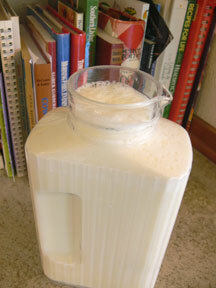 We then transfer mixed milk to glass container and refrigerate immediately. Milk is an important food item for your pantry, and this fortified milk product (Vitamins A and D are added) is perfect for long-term storage. You can't beat it for the taste, the convenience, and the cost. And I think we all agree that "man doesn't live by bread alone"..... and a cold glass of milk is just as necessary! 1 Peter 2:2 "Like newborn babies, crave pure spiritual milk, so that by it you may grow up in your salvation." On the second picture, do you mean to fill the container with water and milk powder, then mix? Teresa-- Yes, I pour the 1 cup of powdered milk into the plastic pitcher, fill with water and then mix with the hand-blender. I then transfer the milk to my glass container. I prefer glass perhaps because it reminds me of the old milk trucks that used to deliver milk to your doorstep. Good memories! Do you have to actually go to their store, or can you order this online for delivery? I have ordered online their wheat and oats, but I have not seen this on the website. Our nearest LDS center is over 100 miles away from us. In visiting store.lds.org, it doesn't appear that the Nonfat Dry Milk is available online. I know 100 miles seems a long way to travel, but maybe you and a few link-minded friends or neighbors could combine a trip and make it worthwhile for everyone. Great advice! The powdered milk I have been buying is from Sam's, which goes bad in about one year. Since we are on year 3 or 4, I have had to replace too many times already. This is great advice!! And the added benefit is this milk tastes SO much better than Sam's or the name brands! Taste and longevity make it the only way to go! Shauna, It is a KitchenAid hand-held mixer that I bought at Target for $49.95. It is electrical -- plugs into the wall. I looked at the cheaper versions (for $29.95) and read their reviews. They didn't seem to last long, and were all battery operated. I decided to buy a little more expensive, and sturdier model, and have been completely satisfied. The extra added benefit is that my husband is impressed with the quality and the ease of using it, so he makes his own milk!